After 2,000 inmates, mostly immigrants, took over a Texas prison in a riot over poor medical services, federal authorities have decided to relocate all the detainees from the now “uninhabitable” correctional facility. The riot at the Willacy County Correctional Center erupted on Friday afternoon, when prisoners refused to eat breakfast or report for work to protest medical services at the facility. The prison was practically run over by the inmates, who continue to hold down the fort. It still remains unclear what medical service issues had upset the inmates. Only around 800 to 900 inmates have refused to riot in a facility that holds some 2,900 people, most of whom are immigrants with criminal record. Authorities in Nebraska have mistakenly freed hundreds of prisoners over several years due to correction officials miscalculating their sentences. Law enforcement is now looking to put dozens of them behind bars again. All in all, 306 inmates were freed erroneously, a situation first exposed by local media outlet Omaha World-Herald. 257 of them won’t be pursued, on condition that they don’t commit any offenses – because they would have completed their sentences by now. Three others died since they were let go, and five have successfully completed their parole. Nearly 9,000 incidents of sexual victimization against inmates in U.S. prisons and jails were reported in 2011, with roughly half of them involving corrections staff, according to a report by the federal Bureau of Justice Statistics. The number of incidents showed a “significant increase” over about 8,400 incidents reported in 2010 and 7,855 reported in 2009, it said. The year 2011 was the most recent cited in the bureau study, published on Thursday. California has been ordered by the US Supreme Court to release up to 46,000 prisoners because of chronic overcrowding, despite one jail in the state only having only two inmates. About 2,000 inmates have staged a revolt at a prison in the capital of Yemen, taken a dozen guards hostage and joined calls by anti-government protesters for the country’s president to step down, a Yemeni security official said. He said the unrest in the Sanaa jail erupted late last night when prisoners set their mattresses ablaze and occupied the facility’s courtyard. He said the guards fired tear gas and gunshots into the air but could not subdue the inmates. The official said today that troops have beefed up security outside the prison. He added that a number of inmates were hurt in the unrest. The Yemeni government escalated its efforts to stop mass protests yesterday calling for the president’s removal, with soldiers firing rubber bullets and tear gas at students camped at a university in the capital during a raid that left at least 98 people wounded, officials said. 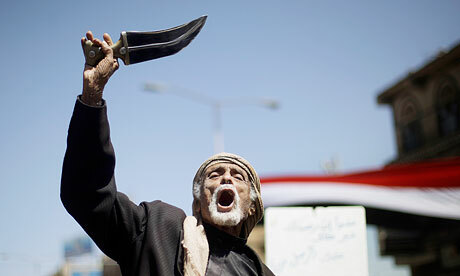 The army stormed the Sana’a University campus hours after thousands of inmates rioted at the central prison in the capital, taking a dozen guards hostage and calling for President Ali Abdullah Saleh to step down. At least one prisoner was killed and 80 people were wounded as the guards fought to control the situation, police said. We need to throw all Americans into prison to close the budget gaps these days. Oh, and even that might be not enough. 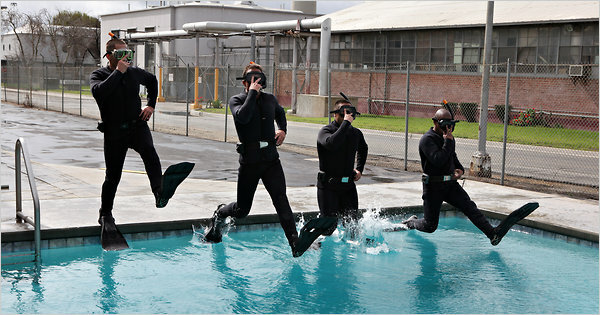 Inmates at the California Institute for Men at Chino in training to perform underwater welding work. JAY, Fla. — Before he went to jail, Danny Ivey had barely seen a backyard garden. But here he was, two years left on his sentence for grand theft, bent over in a field, snapping wide, green collard leaves from their stems. For the rest of the week, Mr. Ivey and his fellow inmates would be eating the greens he picked, and the State of Florida would be saving most of the $2.29 a day it allots for their meals. Prison labor — making license plates, picking up litter — is nothing new, and nearly all states have such programs. But these days, officials are expanding the practice to combat cuts in federal financing and dwindling tax revenue, using prisoners to paint vehicles, clean courthouses, sweep campsites and perform many other services done before the recession by private contractors or government employees. In New Jersey, inmates on roadkill patrol clean deer carcasses from highways. Georgia inmates tend municipal graveyards. In Ohio, they paint their own cells. In California, prison officials hope to expand existing programs, including one in which wet-suit-clad inmates repair leaky public water tanks. There are no figures on how many prisoners have been enrolled in new or expanded programs nationwide, but experts in criminal justice have taken note of the increase. More than 25 of the CIA’s war-on-terror prisoners were subjected to sleep deprivation for as long as 11 days at a time during the administration of former president George Bush, according to The Los Angeles Times. At one stage during the war on terror, the Central Intelligence Agency was allowed to keep prisoners awake for as long as 11 days, the Times reported, citing memoranda made public by the Justice department last month. The limit was later reduced to just over a week, the report stated. Sleep deprivation was one of the most important elements in the CIA’s interrogation programme, seen as more effective than more violent techniques used to help break the will of suspects. Within the CIA it was seen as having the advantage of eroding a prisoner’s will without leaving lasting damage. don’t set yourself against us too. 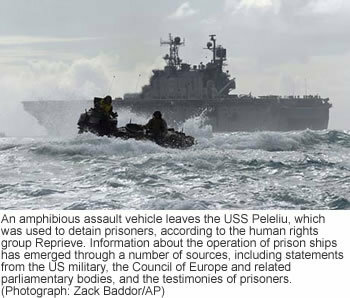 Details of ships where detainees have been held and sites allegedly being used in countries across the world have been compiled as the debate over detention without trial intensifies on both sides of the Atlantic. The US government has been urged to list the names and whereabouts of all those detained. Since 2006, when Stephen Gray’s revelations of Ghost Planes confirmed the suspicions of human rights activists, we have known that our government kidnaps and tortures “suspicious” individuals as a matter of routine. Extraordinary rendition is the NewSpeak term used when this practice is denied. The denials and non-denials have become a mockery, a stain on the soul of America, when the truth is brought to light by an individual such as Maher Arar, who lived to bear witness. And then they would take me back to the interrogation room. Again another set of questions, and the beating starts again and again. On the third day the beating was the worst. They beat me a lot with the cable. And they wanted me to confess that I have been to Afghanistan. This was a big surprise to me because even the Americans who interviewed me, the FBI officials who interviewed me, did not ask me that question. I ended up falsely confessing in order to stop the torture. The torture decreased in intensity.From that moment on they rarely used the cable. Mostly they slapped me on the face, they kicked me, they humiliated me all the time. The first 10 days of my stay in Syria was extremely harsh and during that period I found my cell to be a refuge. I didn’t want to see their faces. But later on living in that cell was horrible. And just to give you an idea about how painful it is to stay in that place–I was ready after a couple of months, I was ready to sign any piece of document for me, not to be released, just to go to another place where it is fit for human being. Stephen Grey, investigative journalist, exposed the CIA’s ghost planes with actual flight logs from the air carriers and photographs from hobby “plane spotters.” The flight logs were proof. Proof of kidnapping and torture of so-called suspicious persons? Highly inconvenient for the Torture Administration. They may have started the ghost ships before, but certainly, they have used them extensively as an alternative to air torture and rendition — and as a matter of expedience. Those declarations, by retired Maj. Gen. Antonio Taguba, are contained in the preface he wrote for a new report by Physicians for Human Rights, “Broken Laws, Broken Lives: Medical Evidence of Torture by US Personnel and Its Impact.” The group said its findings – “based on internationally accepted standards for clinical assessment of torture claims” – are the first to use medical evidence to document first-hand accounts of torture. Eleven former detainees were examined. Taguba testified before Congress in 2004 about the abuses at Abu Ghraib after the U.S. invasion of Iraq in March 2003. His damning report ultimately led to his being pushed out of the Army. ABC News correspondent Jake Tapper noted Taguba’s statements and the report on his blog. Maj. General Taguba led the US Army’s official investigation into the Abu Ghraib prisoner abuse scandal and testified before Congress on his findings in May, 2004. This report tells the largely untold human story of what happened to detainees in our custody when the Commander-in-Chief and those under him authorized a systematic regime of torture. This story is not only written in words: It is scrawled for the rest of these individuals’ lives on their bodies and minds. Our national honor is stained by the indignity and inhumane treatment these men received from their captors. The profiles of these eleven former detainees, none of whom were ever charged with a crime or told why they were detained, are tragic and brutal rebuttals to those who claim that torture is ever justified. Through the experiences of these men in Iraq, Afghanistan, and Guantanamo Bay, we can see the full scope of the damage this illegal and unsound policy has inflicted-both on America’s institutions and our nation’s founding values, which the military, intelligence services, and our justice system are duty-bound to defend. 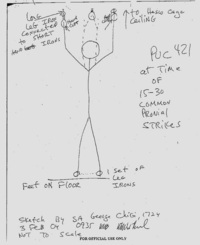 This picture from a U.S. court martial file, drawn by military polygraph examiner George Chigi III, shows how Afghan detainee Dilawar was shackled by his wrists to the ceiling of an isolation cell at Bagram Air Base before being beaten to death in December 2002. KABUL, Afghanistan – American soldiers herded the detainees into holding pens of razor-sharp concertina wire, the kind that’s used to corral livestock. The guards kicked, kneed and punched many of the men until they collapsed in pain. U.S. troops shackled and dragged other detainees to small isolation rooms, then hung them by their wrists from chains dangling from the wire mesh ceiling. Former guards and detainees whom McClatchy interviewed said Bagram was a center of systematic brutality for at least 20 months, starting in late 2001. Yet the soldiers responsible have escaped serious punishment. The public outcry in the United States and abroad has focused on detainee abuse at the U.S. naval base in Guantanamo Bay, Cuba, and at the Abu Ghraib prison in Iraq, but sadistic violence first appeared at Bagram, north of Kabul, and at a similar U.S. internment camp at Kandahar Airfield in southern Afghanistan. Nazar Chaman Gul, an Afghan who was held at Bagram for more than three months in 2003, said he was beaten about every five days. American soldiers would walk into the pen where he slept on the floor and ram their combat boots into his back and stomach, Gul said. “Two or three of them would come in suddenly, tie my hands and beat me,” he said. When the kicking started, Gul said, he’d cry out, “I am not a terrorist,” then beg God for mercy. Mercy was slow in coming. He was shipped to Guantanamo around the late summer of 2003 and imprisoned there for more than three years.